[toc]Carbuncles are large boils which are often caused by bacterial infections. Pus comes out of the carbuncles. They are also extremely painful. If left untreated, carbuncles can damage a bone or nerve. Therefore, it is important to consult a skin doctor for this problem. However, herbal remedies can also be a useful addition to medical treatment. Some of the best herbs for curing this problem include Balsam of Peru, Wild Indigo, Echinacea, Burdock, Cleavers, Dandelion, Licorice and Barberry. 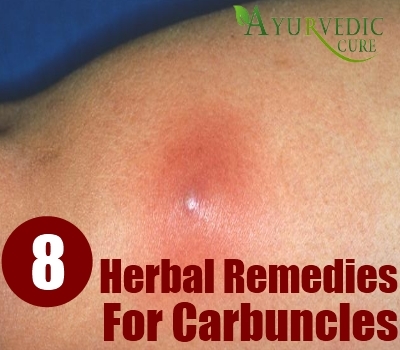 The best herbs to treat carbuncles are those which are stimulating the immune system, purifying the blood, removing toxins and harmful bacteria from the body and liver cooling as well as intestinal heat removing. 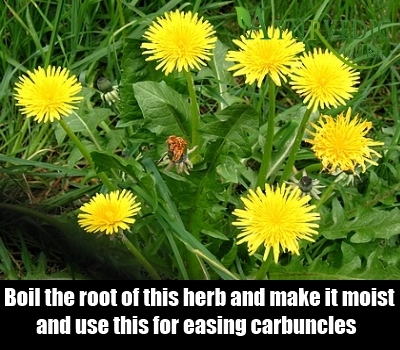 This article covers some of these excellent herbal remedies for curing carbuncles. Echinacea Augustifolia is the botanical name of this herb. Commonly called Purple Cone Flower, this herb is native to Europe. This herb is an immunostimulant which means that it activates and revitalizes the immune system functioning and increases the ability of the body to ward off the bacterial infection causing the carbuncles. For carbuncles caused due to heat or other toxins, this herb also speeds up the healing process. This antibacterial and antiviral herb also has depurative properties. 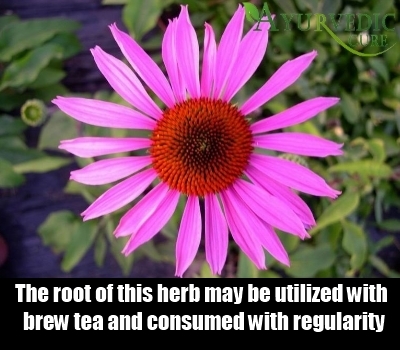 The root of this herb may be utilized to brew tea which must be consumed with regularity to ensure relief from carbuncles. Applying the paste of crushed Echinacea root directly on the carbuncles also helps to heal this skin condition with ease and efficacy. This herb is a well known antiseptic which can be used to heal carbuncles. Used for skin conditions such as eczema, wounds, burns, scabies and boils, this herb can also help you get rid of painful carbuncles. Myroxylon Pereurae is the Latin name of this herb. 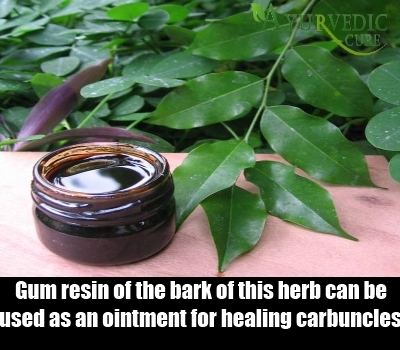 The gum resin of the bark of this herb can be used as an ointment or liniment for healing carbuncles. This herb is also known as Peruvian Balsam. This acrid herb is so effective for bacterial infections such as ringworm that it can also be used to cure bacterial infection induced carbuncles. Baptisia Tinctoria is the Latin name of this herb. It is also called False Indigo. The tincture prepared from the root of this herb can be added to hot water and a compress should then be dipped into the solution and applied on the carbuncles for speedy healing. Wild Indigo is a perennial herb which has heat clearing properties. It removes heat and toxins from the body which are causing the carbuncles. 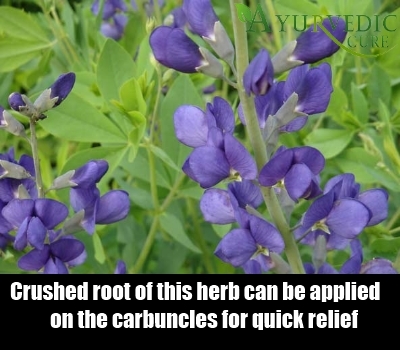 The poultice containing the crushed root of this herb can also be applied on the carbuncles for healing that is quick and relief that is lasting. Burdock is a blood purifying herb. It is available in tincture, tablet and also as an herbal tea. Known botanically as Arctium Lappa and also called Gobo, this herb has a positive impact on the immune system as well. This promotes quick healing of the carbuncles and effective destruction of the harmful bacteria causing this infectious condition. This herb is found throughout Europe and the Eastern coast of the United States. It is also grown in Asia. This herb is a potent depurative which clears toxins from the blood and cleanses the body. This then leads to the subsiding of the carbuncle. Moreover, this herb is also antibacterial which means that if the bacterial infection has led to the eruption of the carbuncle, this herb can be a useful cure for the problem. Taraxacum Officinale is the Latin name of this herb. This herb is rich in vitamins and it stimulates the immune system leading to quick recovery from skin conditions such as carbuncles. Native Americans used to boil this herb in water and use it to treat inflammations and skin conditions. Dandelion also detoxifies the liver and removes toxins from the body as it is a diuretic. 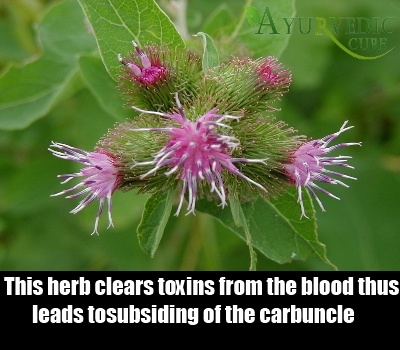 Antibacterial in nature, this herb also eliminates carbuncles caused due to bacterial infections. You can take this herb in extract form for best results. You can also boil the root of this herb and make it moist. Then, you should place the herb ‘s root in a clean cotton bag and use this as a poultice for easing carbuncles. Galium Aparine is the botanical name of this herb. It is an annual herb which is also a diuretic. So, it is very useful in eliminating toxicity from the body which can lead to the effective elimination of carbuncles caused due to the build up of heat and toxins in the body. It also nourishes and cleanses the blood and it has anti-inflammatory properties as well. Due to this, it can cure carbuncles with ease and rapidity. 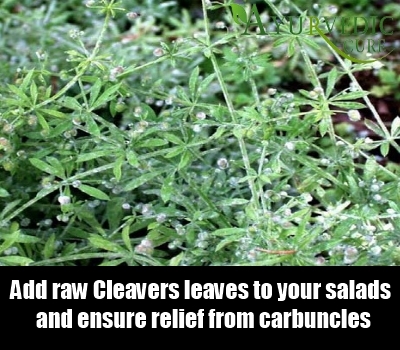 You can add raw Cleavers leaves to your salads and ensure relief from carbuncles. This depurative herb removes toxins from the liver and kidneys and ensures healthy, smooth skin and freedom from carbuncles. Glycyrrhiza Glabra is the botanical name of this herb. It purifies the blood and cleanses the body of toxins. Due to this reason, it is very efficacious for treating carbuncles which have emerged as a result of toxicity and heat in the body. Licorice root extract can be taken for beneficial outcomes. Licorice is also antibacterial because of which it can kill harmful bacteria causing carbuncles. 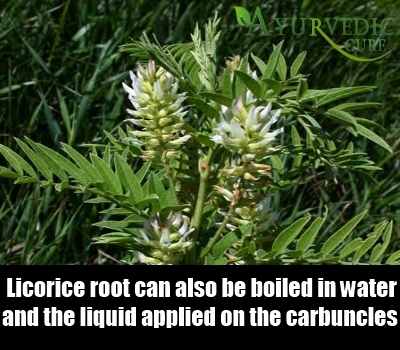 Licorice root can also be boiled in water and the liquid strained and applied on the carbuncles for rapid healing and recovery from this skin condition. Barberry is a potent antibacterial herb. Berberine is a substance found in this herb which destroys harmful bacteria very effectively, according to researchers. Barberry root can be ground into a paste using a blender. 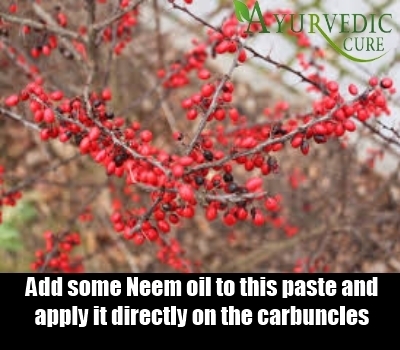 You can then add some Neem oil to this paste and apply it directly on the carbuncles for soothing the pain and curing the infection. Neem is a strong antibacterial herb so adding it to the Barberry root paste will make this herbal remedy extremely effective. Barberry has been used as a medicinal remedy since ancient times. Barberry is also a potent anti-inflammatory herb with immunostimulant properties which makes it an ideal remedy for carbuncles.